While social media is becoming ever more decisive in terms of search engine positioning, branding, traffic and conversions, in the other hand, it needs to be monitored in order to check your online influence. First of all it is difficult to measure from a quantitative point of view, the level of interaction and conversation that occurs in real time. The benefits arising from the active use of social media occur mostly in qualitative terms ( for example, a social media campaign can help grow the brand loyalty to a particular brand) and involve a different number of factors. Separating these factors in measurable segments, which we can understand, monitor and translate into concrete action, becomes essential to improve the strategic impact of social media on our overall ROI. The list you find below will help you to constructively monitor the performance of social media for your business. They are all free tools and extremely simple to use. Google Analytics is one of my favorite tools, as it is the one which can help you monitor the contribution that individual social media platforms brings, with relation to overall traffic to your website. Since some time already, Facebook has provided a fairly comprehensive overview of all its pages, so you can understand the level and quality of interaction of your page and fans. Facebook Insights is divided into 2 main parts: Users and Interaction. The Users section gives you all the basic information about your fans : including active users, number of new like of your page and demographic data about your fans. The Interaction section provides a more in-depth analysis of your page and how people have interacted with it. This is an invaluable data, in order to help you understand what kind of information works more and attract more attention. In fact, in this way you can give your fans exactly what they are looking for. You can access to YouTube Analytics from your Youtube channel by clicking on ‘Account’ and ‘Analytics’ which is under “additional features”. Youtube has made a lot of changes recently and increased the number and value of shared information. In addition to provide data on the views and demographics of your visitors, you can check to which geographic region your videos are most successful, which ones are more popular and how long people stayed to watch them. If the video marketing is at the top of your activity and online business, it is important that you look at these data periodically in order to improve the performance of your strategy. The Twitter search tool allows you to search just filtering by location or the keywords you want to include. But an even more powerful search engine in this sense is Topsy. Some of the information that this tool provides you are the number of retweets, preview of links in tweets, and filtering by hour, day, week, or month. Topsy is undoubtedly a super valuable tool that you need to check. Tweetstats is another free tool for measuring your Twitter profile. All you have to do is enter your Twitter username to access to a chart on the number of tweets you send every day, the number of responses you receive and the moments of the day, which tend to focus your tweets. Now, it may not seem too interesting, but think of how it can be useful in order to look at your competitors (see when they tweet, how often and how you relate to them). At the same time you can see how the level of interaction with your followers grows over time. Also in this case, you may want to separate the search by months, so you can make the inquiry even more precise. Twitter Counter is a useful service to measure some parameters of Twitter, like the followers growth rate, the average number of tweets per day, and more. It also allows you to compare different accounts, which means you can get an instant overview of your relationship with your competition and your overall progress. Twitter Counter has also a widget that you can put on the sidebar of your site and facilitates users to follow you, as well as highlighting the current number of your followers. Simple, but invaluable tools for anyone running a social media account are Bit.ly or Goo.gl. Not only they allow you to shorten your links, but they will also reveal how many people click on your link. Great if you do not use the features of Google Analytics to measure traffic coming to your website from social media. Klout is the center of a debate, as an instrument to measure your level of online influence ( do not take these numbers as really the truth). It is easy to use : sign in with one of your social media account (Twitter or Facebook) and you will receive an immediate score on your grade of influence. The rating takes into account parameters such as the number of followers, number of interactions with your content, and the level of influence of all your social media accounts. A kind of Google Alert, but for social media : Social Mention alerts you whenever a specific keyword is mentioned on a platform of social media. Great to get a comprehensive overview of your social media presence, identify areas of discussion in which you are active or you are mentioned. Hootsuite lets you manage multiple social media accounts at the same time in a quickly and effectively way : Facebook, Foursquare, LinkedIn, Mixi, MySpace, Ping.fm, Twitter and WordPress. Users can update one or more profiles simultaneously, measure the CTR, pre-plan updates, delegate messages and check answers. HootSuite is available with 2 versions, one free and the other is a paid version that includes a free 30-day course and offer more features and benefits. I use the Hootsuite Pro version : it’s definitely worth it! Do not even remotely think to use all these tools together, otherwise you may become crazy. Take into account that some features tend to repeat between a tool and the other. Select the few ones that you think are right for you and make sure you use them regularly to collect data and information, that you can use to improve your social performance. 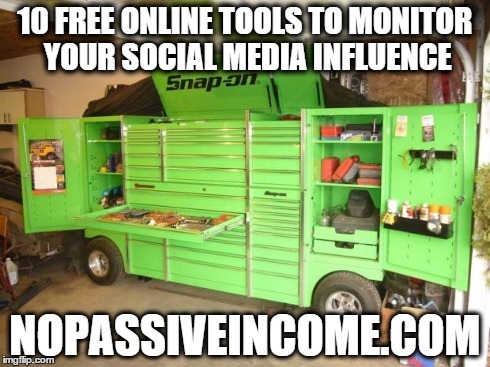 Do you have other tools that you use to monitor your social media influence? Have you ever used some of the tools mentioned in this post? Please share your experience in the comments below, thanks! I have used most of the tools from your list but few are either unknown to me or I haven’t tried ever. Let me check with all once again. Knowing your social influence is the thing you should know so that you can plan better for further strategies. Glad to know there are some new tools for you in this list. Monitoring your social media influence can make you better understand where investing your efforts for a proper online marketing strategy. Thanks for your comment, Atish. glad to know you found this post useful. Included all the online free tools suggested. and have a great day. Hey there Erik! I’m a big fan of YouTube Analytics and I covered the topic in the latest videos on my channel.. I think it’s important to see where your YouTube traffic is coming from – just like we do for our blogs. On thing I don’t use very often is Facebook Insights. I don’t get much reach on my page so I’m not too excited to find out how poorly my page is performing. I just saw that CopyBlogger shut their page down and that gave me food for thought. Thanks for the list Erik! what a pleasure to see you here. and the latest one I can read in the CommentLuv link surely adds value to this post. I’ve just read the post of 3 days ago searching it in Google. Thanks for taking the time to comment, Ileane. An alternative for #9 is mention.net. It tracks twitter and social media very nicely. thanks for adding Mention.net, that’s a good resource. I’ve been listing this tool in one of my older post. Regarding #7: You can put a “+” at the end of bit.ly or goo.gl links to see the stats, even if it isn’t your link. Without going into an exhaustive secondary list, I would also add tweetseeker, SocialCrawletics (to find your popular content), Fruji, SumAll, CircleCount, and Twitter’s built in analytics. But really, as the author suggests at the end, you don’t want to go overboard, so I will stop with these. That’s a smart and useful tip, Kevin. I really appreciate you mentioning some other great tools in your comment. I like Topsy for individual tweets, to see who retweeted and who are considered highly influential (just for fun, mind you). Kloud is quite useless, it’s just a number (and not so accurate, I guess). Topsy is a great tool. You said you are using it for fun. After all, social media should be entertaining. You mention here some great tools that’s are most important for social media as well as webmaster. I have already used most of the tools from your list and find three new tools here. Hope those will also help me to get more traffic from social media. Thanks for the nice sharing. Glad to know you learned something new in this post, Manik. I use some of the tools you’ve mentioned in your post, It’s great that we get to use so many of these for free! There’s a couple on the list that I haven’t heard of so I’ll check them out. Thanks for the heads up. good to know you discovered some new tools from this post. Topsy is new to me. I tried this, but it’s not showing proper result to my blog. Klout, social mention and hootsuite are interesting tools. Thanks for sharing this. good to hear you learned something new from this post. You can check the tools listed here you was not aware of. It’s very important to monitor your presence on social media. It not only helps you plan for future but also helps you determine what others are saying about you. I’ve been using almost all the tools listed here except Tweetstats and Social Mention. I guess it’s time for me to check these too. Thanks a lot for this informative article. Social Mention is great to monitor any specific keyword (like your name or your blog title, for instance). Well written you in this blog about social media, I hope next amazing features from your blog. Thanks for your kind information. Glad you liked the content. I’m using most of the tools listed above and I’d be trying other tools which I haven’t tried. thanks for sharing your feedback. I think google analytics is sufficient. Thanks for writing this and have a nice day ahead. Google Analytics gives pretty much all the stats you need to monitor your website. But the tools mentioned in this post have many other features to check your social media influence. Thanks for the add, Buffer is another great tool. Pretty cool. Until now, I have yet to use Youtube Analytics seriously. Guess I got to dive in and work out MORE on that. Also, awesome lists you have there so keep that up man! good to see you and I’m glad you found something new in this post. I have used most of these tools. according to me Buffer is the best. all of others are also quite good and can be quite handy at the times. Buffer is the one that I would like to recommend my friends. Thanks for adding your views, Riya. Buffer is a great tool! Pinterest analytics is now available for Pinterest users too! Thanks for the add, Jinny!